Your vacation object: The Holiday apartment is located on a 700 sqm and an enclosed property. The property is enclosed with a fence. 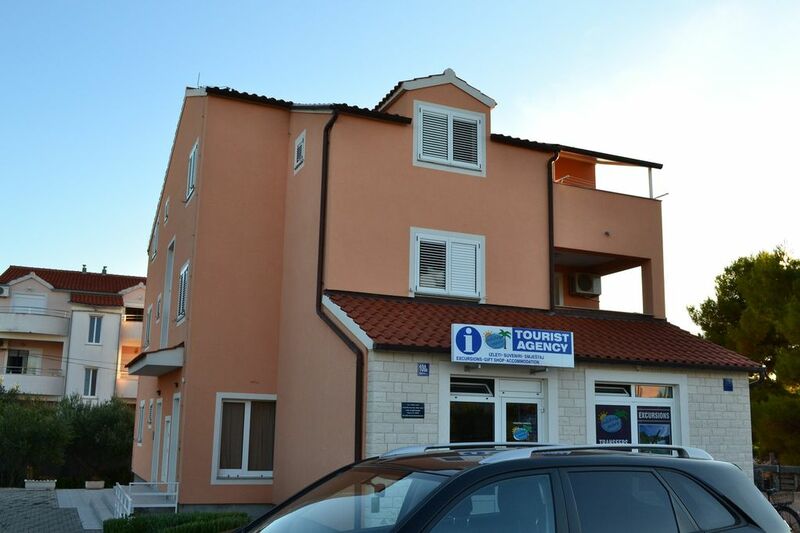 In the same house holiday apartment DAL VOD 353 are (5 persons), DAL VOD 354 (5 persons) and DAL VOD 355 (4 people). The owner lives permanently in the house or, but uses a separate entrance. The facilities are at your disposal for common use. Relax outdoor at the terrace. Barbecue possibilities are available. The common used pool area is open from the beginning of May until the end of September and offers an outdoor pool (5 m x 7 m, depth 1,5 m). Your holiday apartment: Your holiday apartment offers 1 floor, 3 rooms (from which 2 bedrooms), is 55 sqm and can accommodate up to 5 persons. An air conditioning ensures pleasant temperatures on hot days. The entrance is on the ground floor and leads over an internal stair directly in the hallway the vestibule with doors to all rooms. The rooms are divided as follows: Living room 10 sqm and with 1 additional bed at couch/sofa, lounge, dinette and TV. The dinette offers space for 5 persons. You have access to the covered terrace (together with Living room) with garden furniture, 1 table and 5 chairs. Bedroom 12 sqm and with 1 double bed and dinette. Bedroom 10 sqm and with 3 single beds and dinette. Cooking nook in the living room 8 sqm and with dinette, electric cooker (4 plates), oven, refrigerator (freezer), coffee machine and electric water boiler. Bathroom 9 sqm and with shower, 1 washbasin, WC, hairdryer and window. In addition, your holiday apartment is equipped with WLAN- internet access, baby bed, electric iron and washing machine. TV or radio channel can be received per satellite. Pets: nicht erlaubt. bathroom (9 sqm) with shower, 1 washbasin, WC, hair dryer and window.